The Society produces a quarterly Newsletter (March, June, September and December). The latest physical (paper) issue of the Newsletter is only available to members and is not provided to view on this website until the following issue has been distributed…..So to enjoy the current newsletter, join the Society! To see the list of previous issues of the Newsletter click here. The Society has produced eight free heritage trails around Chichester that take you on a journey of more than 2,000 years of history. For more information of this initiative see the Heritage Trails menu. This book, published in 2015, is written by the Society’s former President, Tim Rooth. As secretary in the early seventies, he had a ‘ringside seat’ as the Society came together and started to battle against developments such as the ‘Sack of Somerstown’ and tried to put forward more constructive proposals of its own. This 12 page booklet was produced in October 2013 by the Society with the help of many artists to celebrate 40 years of the Society’s existence. It showcased what the City and the surrounding area has to offer and highlighted what needs to be protected. 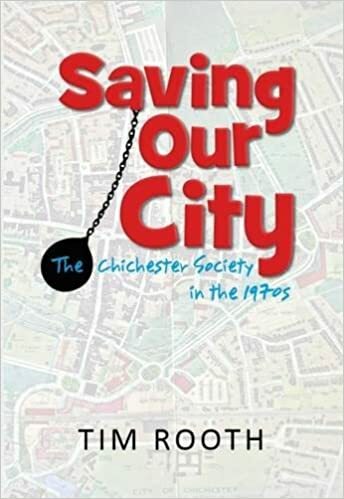 It emphasised that Chichester was at a crossroads and important decisions needed to be taken in relation to the then forthcoming District Council’s Local Plan. Click on the image to view the booklet. This light-hearted, sometimes acid selection of cartoons and verse commented on the various problems that confronted the Chichester Society during the 30 years between 1974 and 2004. Click on the image to view the publication (now out of print). From the archive, we offer some seminal documents. Dating from 1973, there’s the influential article “Chichester’s Crossroads” which was published in the Architects’ Journal in September of that year. Then there are the Shark Leaflet distributed by the Society across the city, and the “City in Balance” Newsletter also distributed by the Society. In March 2005 a Conservation Area Appraisal was published, commissioned by the Chichester District Council. From our more recent past in July 2013 came a “Plea to Councillors” for those who were to consider the Local Plan. It was produced by the Society and the Chichester Residents’ Association Group (CRAG). This was followed by “Chichester Today and Tomorrow” in October 2013 published principally to celebrate the Society’s 40th birthday, but also timely as a new Local Plan was in preparation. In September 2014, to accompany that issue of the Newsletter, a 2 page insert titled “What Makes Chichester Special” was produced for those participating, or interested in the then forthcoming examination-in-public of the Chichester District Council’s Local Plan.